Below are two brief profiles of two individuals whose lives and futures have been dramtically changed. Started as an Out-Grower in March of 2012. Before involvement with the program, he had 2 faddans (about 2 acres), and now has 6 faddans of maize producing 1,900 kilograms, even though planted thinly. The program plowed for him 3 faddans at 150 dollars per faddan in 2012, and 5 faddans in 2013 at 200 dollars per faddan. 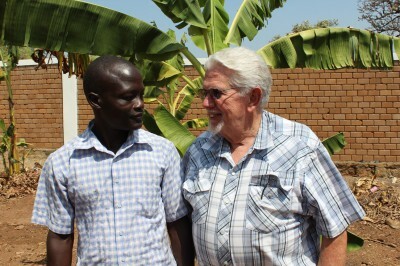 Santo attended four courses; one for land preparation, one for planting, one for weeding and one for harvesting. Benefits & Improvements: Santo has been able to buy one cow, a bicycle, and pay school fees for his children. His wife and oldest child, when not in school, help with field work. Counsel has been offered to Santo to choose the best time to sell, depending on the market values. He indicated that he plans to sell to market 15 of the 19 bags he has produced this growing season, reserving four for his own family. Some suggestions have been offered to Santo concerning seeding rate, fertilizer and herbicide application programs, and he indicated that further teaching is needed in these areas. Santo also produces honey and asked if we can help him market the 200 litres he harvested this last season. When we first saw Kwaje Emelda Moi, she was dressed so well we wondered . . . “she doesn’t look very needy!” We interviewed her, and her story was both sad and hopeful. Emelda is one of two wives in a family which has five children aged up to fifteen years old. The three adults and five children have been subsisting on slightly less than an acre of land. The family had been plagued by syphilis, but were eventually treated successfully. Their lives were tough and poverty had a solid grip on them. Their food rarely lasted until the next rainy season. They knew what real hunger is! Then they heard of the Savannah Farmers Cooperative (SFC) Out-Growers Program which might be able to help plow their land if they cleared it of bushes, roots and several trees. A few trees were too big to clear. In 2011 they applied for help in ploughing, a job until then which was done with nothing but hand hoes. SFC was able to help them expand by plowing a full two acres. They planted both maize and ground-nuts (We call them peanuts,) as well as some garden vegetables. They not only produced enough food for their whole family for the year, but grew and sold 500kg of maize and 500kg of ground-nuts which they sold in a local market. They felt prosperous for the first time in their lives. The first benefit Emelda mentioned was that they were able to pay school fees for all their children. They were also able to provide better clothes, including school uniforms. Theirs has been a long dark tunnel, but they see light and hope at the other end of the tunnel and plan to clear another two acres for ploughing this year. They expect to be ‘rich’ and able to build a brick house with a galvanized tin roof in the future.